Prosecutors are trying to cast doubt on the accuracy of an animated video that lawyers are using to defend a white Chicago police officer on trial for fatally shooting a black teenager. Attorneys for Jason Van Dyke showed the animated video to jurors Tuesday . His lawyers say it depicts what Van Dyke saw before he opened fire on 17-year-old Laquan McDonald in 2014. The animated video is aimed at countering police dashcam video that shows Van Dyke shooting McDonald 16 times as the teen holds a knife and walks away from officers. Prosecutor Marilyn Hite Ross questioned the producer of the animated video, saying the depiction contained multiple inaccuracies. She noted the animation has the officer shooting just five times when there’s no dispute he fired 16 times. Ross also said the animation a dark red line highlighting McDonald made him look taller than he was in real life. The judge recessed Tuesday afternoon. The defense will resume calling witnesses Wednesday. Lawyers for a white Chicago police officer who fatally shot a black teenager are presenting jurors an animated video intended to show the officer’s perspective during the shooting. The video was created for the defense and shown to jurors Tuesday . It is aimed at countering graphic police-dashcam video of the 2014 shooting taken from another angle. 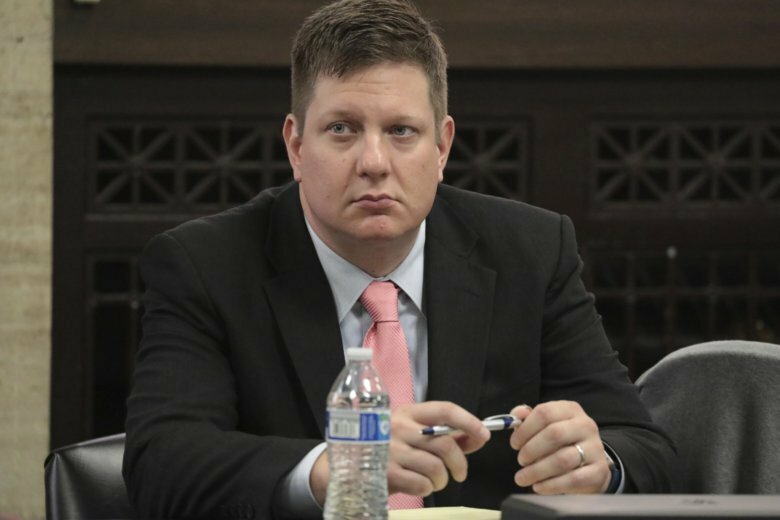 The dashcam video is the centerpiece of the state’s case against Jason Van Dyke. It appears to show the officer shooting Laquan McDonald 16 times as the teen holds a knife and walks away from officers. What Van Dyke saw could be critical during his murder trial, as jurors try to determine if it was reasonable for him to view McDonald as a threat. It’s unclear if Van Dyke will testify during the trial. Lawyers for a white Chicago police officer on trial for murder have called a witness to discuss the past behavior of the black teenager the officer shot 16 times. Jason Van Dyke’s attorneys resumed presenting their case Tuesday by calling probation officer Dina Randazzo to the stand. Randazzo testified that the teen, Laquan McDonald, had become “combative” at a juvenile hearing. On Monday, three county employees told jurors about physical altercations with McDonald. McDonald was armed with a knife and had slashed the tires of a police car when Van Dyke shot him. Defense attorneys are focusing on McDonald’s behavior the day he was killed and in previous years. Under Illinois law, defendants who claim self-defense can present evidence about the past behavior of the person they killed, even if they weren’t aware of that history when the killing occurred. A forensic pathologist who testified Monday for the defense criticized the official autopsy results . Shaku Teas’ testimony seemed to contradict what the video of the 2014 shooting of Laquan McDonald shows. The white officer shot the black teenager 16 times . Teas said she believes at least 12 of the 16 shots fired by Van Dyke hit McDonald before the teen was on the ground. Prosecutors rested their case last week and defense attorneys started presenting theirs Monday. Besides the forensic pathologist, the defense called county juvenile detention and sheriff’s department workers who testified about the teen’s history of violent behavior. It remains unclear whether Van Dyke will testify.